I will be perfectly honest. I haven't spent as much time as I would have liked helping my younger son to master the alphabet. Although, it is not that I have done nothing. I point letters out when the opportunity arises and he does have an alphabet place mat which I quiz him on from time to time at meal times. 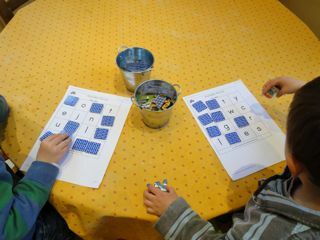 We sometimes play alphabet activities such as Fishing for Letters and he is starting to learn letters at preschool. I am sure he also absorbs a lot from his older brother and I read aloud to him daily which increases his exposure to words and letters. Although he does know some of the letters he hasn't grasped them all yet. So I thought it was time we had some fun with various alphabet activities to help him practice those letters with which he is less familiar. Keep reading to see what we are playing. I am being careful to keep it stress-free, playing only a little every now and then. I have taken to keeping his favourite games in the kitchen so we can play them whenever we have a moment and he is keen to play. My elder son joined in with many of these alphabet activities too. Although he knows his letters he still found the activities fun and he could obviously work independently in completing them, using the alphabet song to help get the order right when needed. One day my younger son started playing with these sweet wooden animals that we have, so I grabbed the opportunity to turn it into an activity. I simply laid out letter cards on the table for the first letter of each of the animals' names and asked my son to match the animal to the letter. It was a quick game but he enjoyed it. Obviously you could do this with any collection of objects that your child is playing with at the time. Print out one card for each player (you can choose whether to use just capital letters, just small letters, or a mix of both). Print out and cut up the 'bingo balls' from the same website, creating 26 individual pieces of paper each containing one letter of the alphabet. Or, if you have a set of magnetic letters like we do, you can use these instead. Put the bingo balls into a bag or container. Find something to use as counters - dry beans, pennies, small paper squares, m&ms or pieces from other games. Pick a 'bingo ball' from the bag and say the sound. I prefer to use letter sounds rather than letter names, since this helps at the next stage when my child will start blending letters together to make words. If your child has that letter on his card he should cover it with a counter. The first person to make a horizontal, vertical or diagonal line across four letters is the first winner. We then continue to see who covers all the spots on their card with counters to find the second winner. 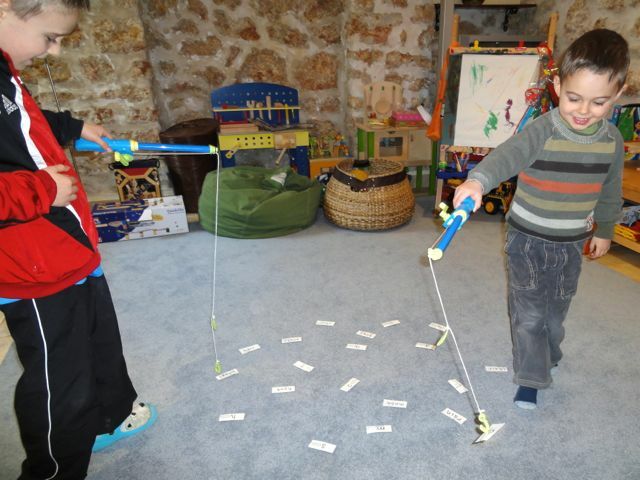 My sons really enjoyed these alphabet activities which are also from Lanternfish. In the alphabet maze your child follows the alphabet to get out of the maze. You can choose from treasure, monsters or sea mazes. At first I helped my younger son by saying the letter sound in alphabetic order so that he knew the next one to look for. However, later in the maze when he worked out the route on his own, I asked him to say the name of the letter as he drew over it. 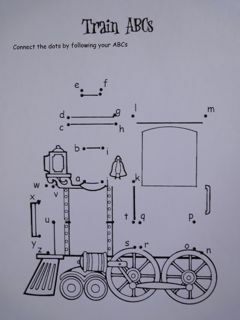 In the dot-to-dot puzzles your child connects the dots in the picture by following the alphabet. There are various pictures to choose from on the website. In this game I also helped my son by telling him the sound of the next letter to look for. 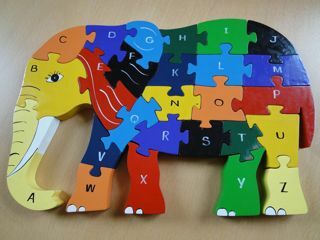 I love this wooden alphabet elephant puzzle which my elder son received a few years ago as a present. Following the same theme is this sweet alphabet Giraffe Puzzle . The puzzles are quite difficult to do without knowing which piece comes next, so they really do encourage your child to learn their abc's. I laid out all the jigsaw pieces randomly on the table, but made sure that the letters were pointing in the right direction for my son to read them properly. I then sounded out each letter in turn and he found the letter and added it to the puzzle. If you want to involve an elder sibling in the game, ask them to sound out the letters in alphabetic order instead of you. There is a range of fun alphabet games to play on PBS Kids, incorporating popular TV characters to encourage your child. In this game from Letters and Sounds your child tries to match the picture of an object with the first letter of the object's name. In Kangeroo Confusion your child practices matching capital and small letters. 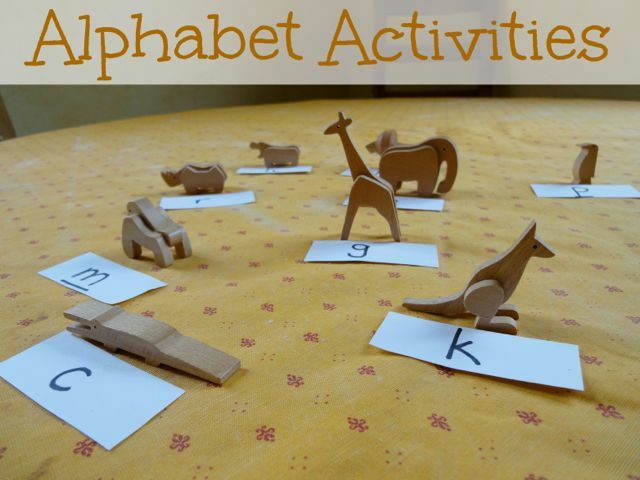 Have fun playing these alphabet activities! You can find more ideas here for early literacy activities which help your child to learn the letters.